Villa Burung’s staff takes care of all regular tasks and chores to ensure a carefree holiday for you. Their salaries are paid by us and settled via the rent charged. In this way we stimulate local employment and thus a better financial situation for the inhabitants. The village’s mayor actually appoints those who can apply for such a job. Generally the employees selected remain attached to the villa for years. Villa Burung has 5 dedicated employees: Anni, James, Hariz, Made and Ketut. Anni and James (married couple), take care of the household including preparation of two cold and one warm meal per day. They are available from 08.00-13:00 and 17:00-20:00. Hariz is your boats man and also responsible for the garden and swimming pool. He usually starts and finishes somewhat earlier. Made and Ketut are the security guards. They are present from 18:00 till 06:00, but you will hardly notice their presence. Sunday is a non-working day for the whole staff. Anni and James purchase the necessary groceries from the local markets or warungs (small shops). The next bigger location to buy food is the Hardy’s at Seririt. The money for groceries is not included in the rent for the villa. Unless you buy the groceries yourself, we request that you provide for a small budget of around 300.000 IDR to Anni and James to get them started. For this they will do the required shopping and hand-over the purchase slips daily to you. As most goods are purchased locally they get a better price then visitors. The supermarkets do not require negotiation skills but then also charge higher (fixed) prices. Anni and James, depending on your choice of foods, will charge a small fee for collecting the groceries as this is done with their own scooter. Mosquitos could be of nuisance at dusk. The fan wind helps to keep them away but it is good practice to further protect yourself with anti insect milk / lotion. Besides an occasional elephant bug there are small ants and other little harmless creatures that come standard with this climates package. Butterflies and birds are however limited to the daylight hours. Perhaps good to mention is that the villa is also guarded by some small bats during the night. They elegantly fly underneath the terraces roof in search of small flying insects. 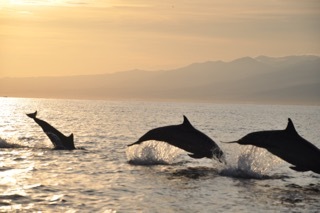 During their flight they may even pass over your head, but no worries, as they will never touch you or any other object due to their excellent sonar system. The seabed descends very slowly just off the beach. Although rocky in the beginning, it provides a good opportunity for snorkel starters. The rocks exchange scenery for sand plates and the coral reef with its typical inhabitants. Vision may be limited if the sea gets a bit rougher or if it has just rained. Rain increases the water flow from the Mountain Rivers into the sea alongside a cloud of mud that visibly changes the sea’s watercolor. Please do not touch any of the corals or marine animals. This is to keep the environment undamaged and you safe, since some of the sea animals could be poisonous. Small dolphin shoals are regularly spotted of the terrace. We have not heard of snorkelers getting in contact with them. If you do, please let us know. If luck is not enough to see the dolphins then Hariz can also increase your chances by accompanying you on a “dolphin-tour”. 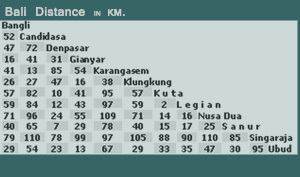 The table below showing the average distance for Bali, this will help you to decide your travelling to Bali. Inform yourself whether a visum at arrival is necessary. Recent for most developed countries in the world Indonesia does not require a short stay (30 days) visum anymore. Once you are in Bali, the cost of living is quite inexpensive. 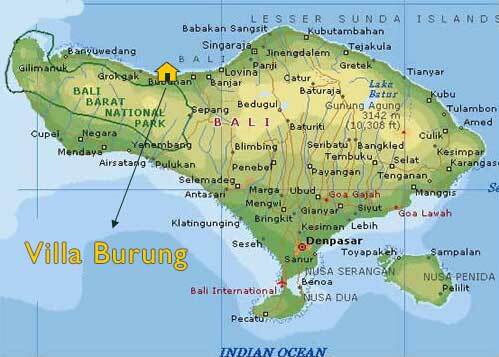 Bali, being part of Indonesia, uses the Indonesian currency, the Rupiah (abbreviated, Rp.) as its monetary unit. Banknotes come in a range of denominations, including the commonly available Rp.100,000, Rp.50,000, Rp.20,000, Rp.10,000, Rp.5,000, Rp.1,000 notes, while useful coin denominations are Rp.500 and Rp.100. All of the notes and coins are reasonably distinctive, but take care while you are getting used to dealing with the cash as there are a mix of old and new styles in circulation. Exchange rates have run up to around Rp.15,000 to one U.S. dollar (see Google for current rates). Always check your local newspapers for current exchange rates, but expect a lesser rate when converting to Rupiah, as commissions will be charged on the conversion transactions. Most major credit cards are acceptable at hotels, large restaurants, department stores, travel agencies and many businesses that cater to the tourist trade, including galleries, arts and craft sellers. Use creditcards for major expenses. It will also give you the best exchange rates. VISA and Mastercard are the most widely accepted cards. The authorised money changer at the airport may offer lower rates than in the more popular tourist areas, so be sure to have a small note (no larger than about $10 or $20) ready to cash there, and move on an alternative location to cash larger amounts. Bargaining is customary at markets and small shops, but is not accepted in supermarkets, department stores and boutiques. Look for signs that indicate “fixed price” before attempting to bargain. If you make frequent phone calls, buy a phone card. Often, you may be able to obtain a product or service for as little as one third of the initial asking price, but one half is typical. Service and craft goods are more likely to be sold at a lower cost than manufactured goods, as the seller must make some profit to earn a living, and the margins may be less depending upon the wholesale source of the goods.